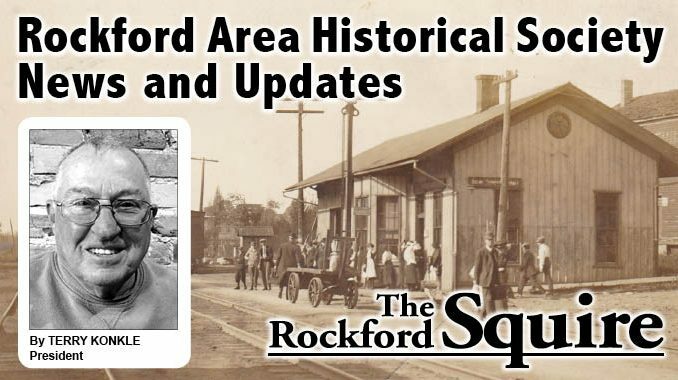 The next regular Rockford Area Historical Society (RAHS) meeting will take place on Thursday, May 3, 2018 at the Rockford Community Cabin. The 7:00 P.M. get together will feature a panel of people who spent time at rural schools in the Rockford area. They will discuss their experiences and give information about the school they attended. Readers are welcome to take part in the evening. One does not have to be a member and there is no charge. It will be a positive evening. The last “Nugget” of Rockford history was ten question true-false quiz. Cliff Hill, Nancy Hill, Carole Holden Christensen and Lee Paull contacted me and all of them did well. My thanks to them for participating. Here are the answers: (1) True – Mr./Mrs. Adolph Krause did donate to expand the Krause Library ; (2) True – Our Lady of Consolation Church was dedicated in 1968; (3) True -There are no longer burials in Pioneer Cemetery; (4) False – There was an elementary school in Edgerton (destroyed by a tornado); (5) True – Krause Library sits on the site of a city park; (6) True – There was a field used by Rockford Little League at Rotary Park ; (7) True – Mr./Mrs. Victor Krause did finance an indoor swimming pool after much discussion; (8) False – Pickleball is not an M.H.S.A.A. sport; (9) False- Rockford Post Office has always been just that and (10) True- Merritt Lamb did start the Boy Scouts in Rockford. The new “Nugget” is a fifteen question matching quiz asking readers to give the location for each of the fifteen statements. There are only four possible answers, so all of them will be used at least more than once. Please contact me by email at tnjkonkle@hotmail.com or by phone at 616-866-0530. The RAHS was blessed for many years with the help of long time member Kathy Cornwell who passed away on April 13, 2018. She was our museum director for several years following in the footsteps of her mother, Katherine Mancell, who was director before her. Kathy worked at the museum when it was located down by the Rockford Dam and was an excellent historian with a passion for genealogy. She helped many visitors with research and kept the museum operating. She worked with docents to give tours and often cleaned some of the artifacts. Failing health slowed her down in recent years, but she did get an opportunity to visit the new museum which she told me that she liked. 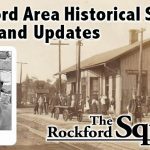 I spent many days at the old museum gathering information on Rockford athletics when she was in charge and had many good discussions with her. The new museum research area has lots of things that she put together, so her work lives on. As always, please contact me with your questions, comments, suggestions, concerns and especially corrections. Have a great, positive week!